Has anyone realized how freaking bright the sun is? I mean REALLY? It's just like sitting a billion jillion miles away in outer space, but if you look up at the sun it's just like, "KEEP LOOKING AT ME AND I'LL KILL YOU." "I'm in ur sky, burning out ur retinas!" Once I stared into the sun for three hours to spite it and it made me blind for a month. 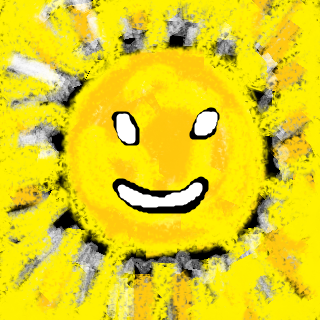 The sun is a guy you don't want to tangle with. 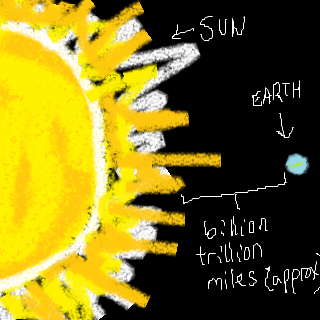 Here's a diagram of the difference between earth and the sun. It's pretty accurate except the sun should be even huger. Bigger than your face. Bigger than your house. Hotter than your mom. As you can see, the two are a billion trillion miles away (approximately). The sun is so hot it has to be an extra bijillion miles way to make it cold in winter. I think. 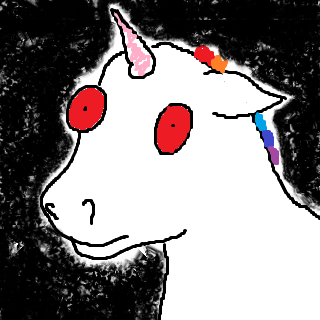 I'm a unicorn, not a meterologist. 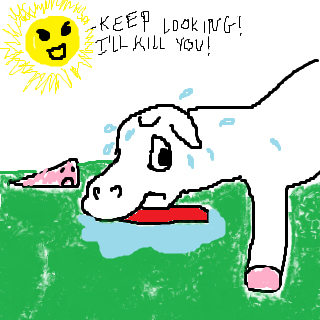 All I know is the sun is about a bijillion miles TOO CLOSE right now because I'm sweating my horn off! Don't look at the sun. Your eyes don't like that. A couple days ago my other neighbor, a cat lady who lives under the bridge, ran into me at the sub shop. She asked me if I could house sit for her and look after her cats. I'm pretty sure that's what she said, anyway. I don't speak cat very well. I told her I'd do it if she paid for my sandwich. A few minutes later the sub shop lady chased us both out with a mop. Apparently the story lady doesn't take cat hair as currency. I'll pay her in unicorn lovin' later on. So I've been looking after this lady's house for a while, but she hasn't come back. It's hard to watch after them all because her doors don't lock, or even close. Can anyone in the area help me out? I don't know what cats eat. They seem to like my flesh, but I need that. Let me know if you can take these cats. 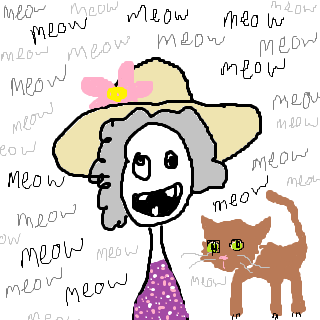 If cat lady doesn't show up in another day, you can have them. I know she probably wants to eat them herself, but there's no use in them going to waste. 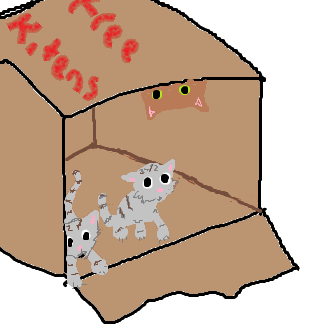 I don't know what cats taste like, but I know they probably won't be fresh much longer out of the refrigerator, so please respond quickly. A little while ago, I found out my neighbor was taken to the hospital for third degree burns. He's okay now because the doctor knows how to treat that. This is why you need to be safe near fire, kids! 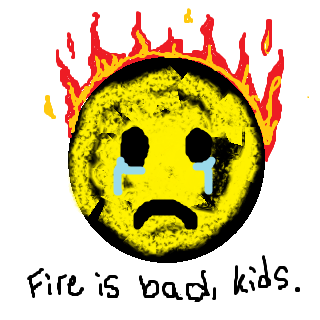 Don't ever play with it, because fire is not a friendly thing. 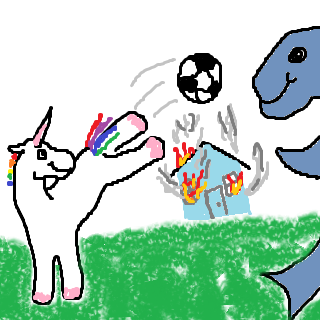 Only aquatic animals and firemen are experienced with handling fire. 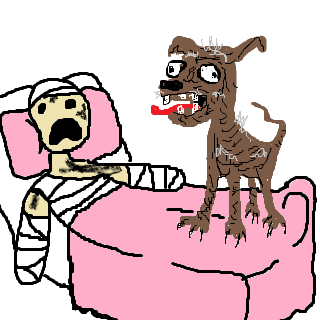 So I decided to visit him in the hospital and make him feel better. Hospitals LOVE visits from unicorns. Everyone wanted me to heal them but I already used my magic sparkle on macaroni art this morning. 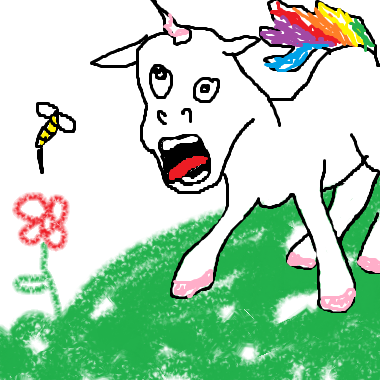 I wanted to bring my neighbor a gift but unicorns don't have any income or creative skills. So I found this dog on the side of the road on the way to the hospital. 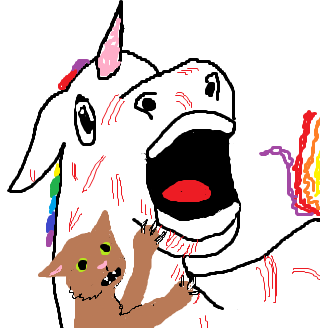 I've heard that a dog is a nonicorn's best friend. Poor thing looked like he needed a friend. My neighbor was very excited to see his new dog. 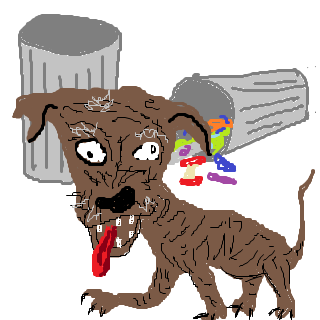 He couldn't talk very well because of the pain medication, so I helped him name his new dog, Princess. I made sure his pillow was extra fluffy and then I left so he and his new best friend could get acquainted. Do dogs show their love by foaming at the mouth? If so, Princess loves his new owner a LOT. Whaley came over again today! 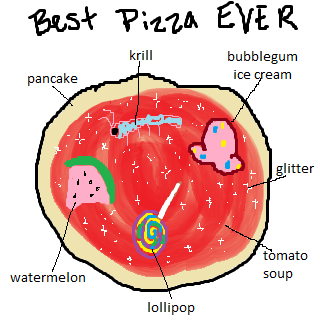 We made a pizza with all of our favorite stuff on it. Here's the recipe for you nonicorns. You may not be able to pull it off without unicorn magic, but you can try! First of all, we didn't have any pizza dough. We used a big pancake instead. Then we put tomato soup on it for the sauce. You can add some seasoning like chili powder for flavor. Then we added our favorite foods. Large krill for Whaley, glitter for me. We both love bubblegum ice cream, watermelon, and lollipops! 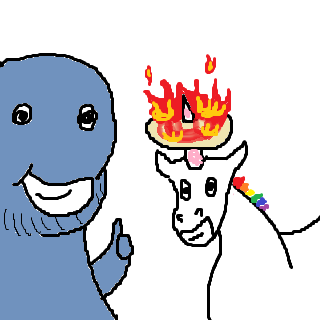 Then Whaley put the pizza into the oven. Be careful because ovens are hot! 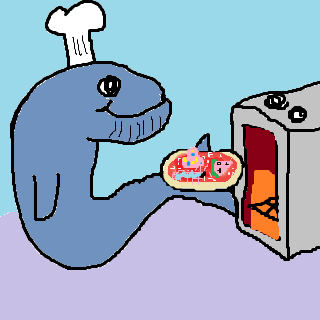 Only aquatic animals should put pizza into a hot oven. Their wet environment protects them. Then we played outside while we waited for our pizza to finish cooking. Whaley knew when the pizza was ready. I'm glad he was there to supervise because he is also a volunteer fireman. Safety first, always! Then my neighbor came home. I offered him some pizza but he was all, "WHO ARE YOU? WHY IS MY HOUSE ON FIRE? WHAT ARE YOU DOING? 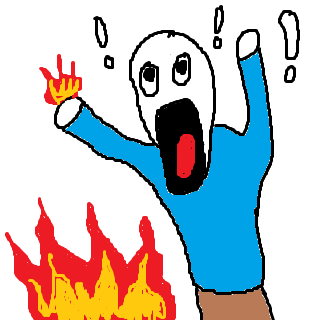 OH GOD I'M ON FIRE! HELP!" It was very rude, so we left. Nonicorns, if you are offered pizza, don't be so rude! Nobody likes screaming and yelling. 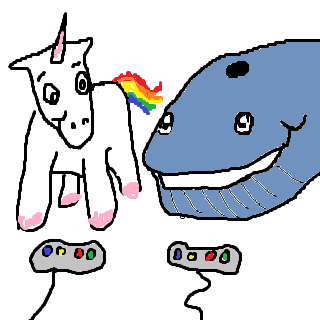 My whale friend and I played video games today! I'm not sure what the wires were for. Whaley told me it's supposed to plug into something, but what does he know? 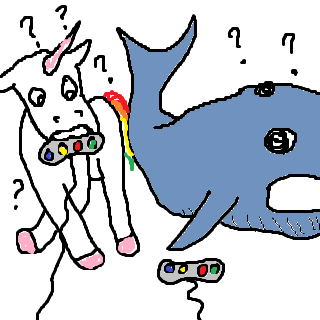 They don't have video games in the ocean! Video games are on the land. I live on the land. I know what I'm doing! I finally figured out that you win if you have the most damage. I think I got the high score! So I went down to the store today but they were all out of Pretty Pony Sunblock and Bee Repellent. I trotted all through the store, but all I got was my tail yanked at least twelve times. I seriously considered impaling some of those nonicorns. Spent my day frolicking in a meadow. What a nightmare! 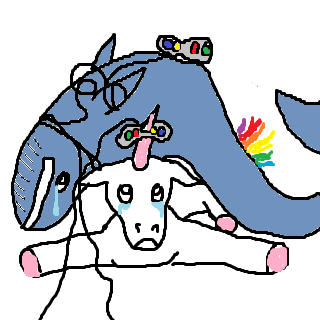 unicorns have a HARD life, let me tell you! First, someone ate ALL the frakking dandelions. They have the most flavor!! 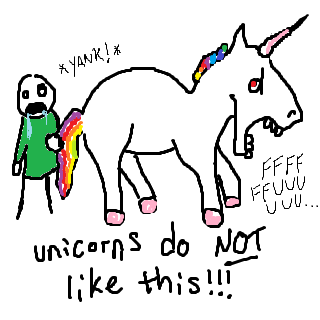 Must have been that other unicorn! jerk! Second, when I found this awesome tasty flower a BEE came out of nowhere!!! What is WRONG with bees!?! I lost my ability to sparkle for the rest of the day! I don't think I'll frolic tomorrow. 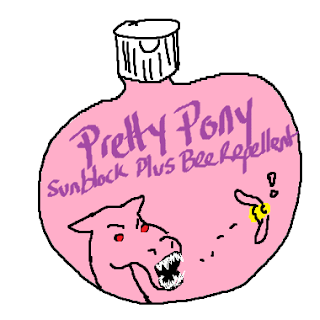 maybe a trip down to the store instead to buy some Pretty Pony Sunblock Plus Bee Repellent.